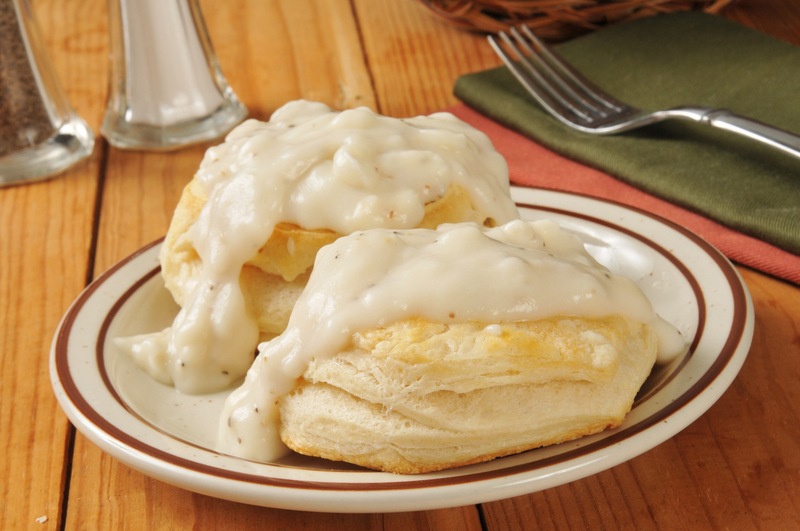 One hot, sunny morning, it became my favorite breakfast in the whole world… My grandpa ordered biscuits and gravy at a truck stop in Texas. I’d never tried it, and I rarely ate breakfast. My heart swelled with love for him, knowing he was looking forward to his meal. Smiling up at the waitress, I said, “I’ll have the same!” My grandma couldn’t resist, and the three of us eagerly dug into the steamy, soaking, baked deliciousness, once our dishes arrived. My mouth, stomach, and heart were full. I was sitting at a tiny table where I was smack dab in the middle of big love. My grandparents were driving me home from college, and would be staying for a visit. It was a good thing I had eaten such a heavy meal, because it helped me to be able to close my eyes, and force myself to sleep for the rest of the scary ride! I was a city girl. I knew I could navigate my way through the heavy Dallas and San Antonio traffic, more easily than my grandparents. They were much older, and they were used to driving on rural roads through beautiful farm country. I didn’t want to offend my grandpa, who had his trusty compass sitting on the dash, pointing the way south. I made myself lie down on the backseat and prayed we wouldn’t die! How I loved him! How I loved her! How I love God, who brought us safely home that trip! I can’t wait for Heaven, where one day, I’ll be able to eat biscuits and gravy again with my grandparents! I know my grandpa is there, because several years later, I led him to Christ when he was 82 years old! When I asked him if he wanted to ask Jesus into his heart, he replied, “Sure do!” My grandma started crying tears of joy over the telephone. After the heart attacks and the lung cancer and the hardships, she could now live in peace, knowing she’d find him in Heaven when it was her turn to go home. Grandpa died two years later, at the age of 84. My grandma has since joined him, in blessed eternity.